About five months ago my Nelson-Rigg Econo Cover ripped right down the center. To be fair I had it for well over a year, and it only cost me in the ballpark of $18. However, the economy cover was too thin, and didn’t really handle the heat of my cooling engine well. After spending $50 per month on garage parking for about four times, I decided to go back to street parking, (despite my enduring paranoia). 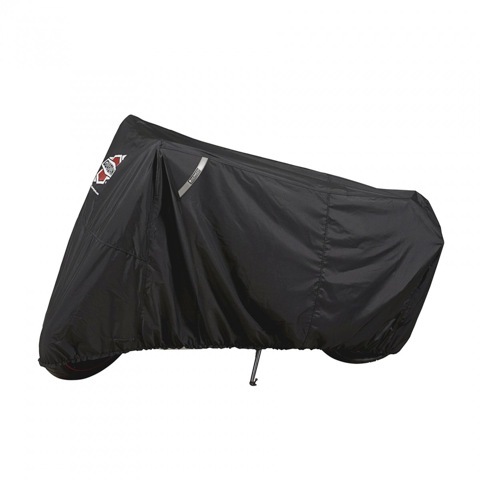 I actually did quite a bit of research before I going with the Dowco Guardian motorcycle cover. I wanted my new cover to be a little heavy so it wouldn’t blow in the wind. The drawstring at the bottom is a great feature of the Dowco Guardian Cover. It secures the cover onto the bike, and makes sure the cover isn’t loosely blowing in the wind. You do have to be careful taking the cover off though. 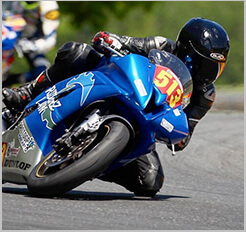 The last thing you want is to damage your cover on something sharp by yanking if off the bike. I know a lot of these things don’t last as long as they could, since some riders put the cover over a hot bike. I’ve done this myself in the past, and my old cover paid the price I’m sure. However, the Dowco Guardian has ventilation slots to allow the bike to continue cooling after you’ve put it on. To help prolong the life of the cover, I still attempt to wait about ten or more minutes before I place it on my bike. With that said, it comes with a lifetime warranty (making me feel slightly better about the investment it required). Additionally, it's waterproof. Not a huge necessity here in Los Angeles…but it does rain at least a handful of days throughout the year. Retail for these run between $88-$130 depending on the size of your bike. Generally speaking, I’m pretty frugal. But I found that you get what you pay for when it comes to covering your ride. I noticed the difference immediately, and I would recommend the Weatherall to any rider.